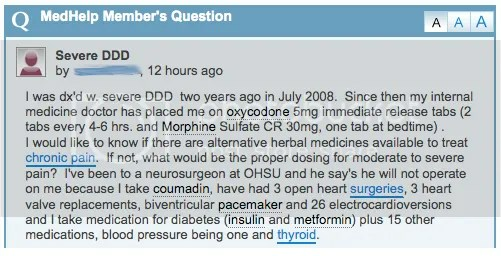 The image above is a screen capture of a question that was addressed to me through MedHelp.org. 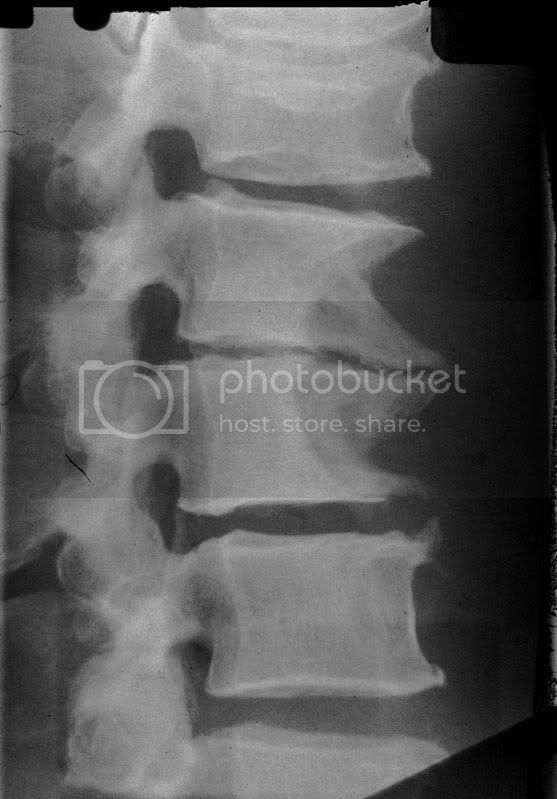 Here we have a 55-year-old woman who was diagnosed with Degenerative Disc Disease (DDD)… Think of it as arthritis of the spine. To help ease the pain, she takes two extremely powerful and potentially addictive narcotics (morphine & oxycodone). She claims to have had quite a surgical history, mentioning three open heart surgeries, including three heart valve replacements, installation of a pacemaker, and 26 shock treatments designed to restart an irregular heart beat. She’s taking two different medications for diabetes, one for high blood pressure, and one for a thyroid problem. An area neurosurgeon refused to perform surgery because of her dependency on coumadin, a blood-thinning medication. And if that wasn’t enough, she also takes 15 “other” medications. This question is a great example of how people often turn towards alternative health care at the wrong time. It wasn’t until medication #21 that she inquired about holistic treatments. And she’s not an exception… hundreds of thousands of people just like her wait far longer than they ever should before ever considering natural or preventive measures. The results a person can achieve with alternative health care are noteworthy, but to physically and chemically abuse your body for decades and then expect a chiropractor, naturopath, or acupuncturist to “cure” you is obscenely unrealistic. It’s bizarre, but I guess it comes down to the health paradigm they live and breathe. Some people just take their MD’s word for truth, regardless of the lack of common-sense or science behind it. Is Your Health in Debt?